I did not start out as a believer in co-ed Scouting. For most of the last 35 years I’ve been a volunteer with the Boy Scouts of America the status quo worked fine for me, co-ed Scouting was a big unknown, and being unknown it was something to resist. Three Things That Changed My Mind. First – during a week-long international Scouting trip several years ago (and two more since) I watched co-ed Scouting at work. Almost every other Scouting association in the world is co-ed. Most of us haven’t seen co-ed Scouting in action on that scale. It wasn’t complicated, a Scout is a Scout, it was that simple. Second – I’ve talked to Scouters from many different parts of the world at length about co-ed Scouting. I probed for problems or regrets, I didn’t find any. Third – and most important, nearly six years ago our first grandchild was born. Before long she’ll be old enough to have the same experiences and advantages Scouting afforded her Eagle Scout father. I know and admire Girl Scouts and Girl Scout leaders but the Girl Scouts of the USA does not offer the same experience her father had. The GSA and BSA are separate organizations with meaningful differences between their programs. Some Scouts will do better in one versus the other, not because of their gender, but because of their interests and ambitions. There’s no reason gender should limit the opportunities my granddaughter (or any child) has in life. I think my granddaughter and her parents ought to be able to choose the Scouting program and organization that best fits her interests and ambitions. A week ago it seemed she’d have this choice, but now I am not so sure. There has been much talk about “Family Scouting” and ways to perhaps serve girls in the elementary and middle school years. On Thursday, after the rather “canned” national presentation, there will be an opportunity for discussion. More importantly, there will be an opportunity for you to send you thoughts and comments directly to the National team that is tasked with studying this opportunity. Our Committee Chair and new Scoutmaster told me they would be attending. I decided I’d stay away because I am fidgety and impatient at meetings of any kind. Besides, given the chance, I end up talking too much. I did, however, have something to say on the subject, so I decided I’d write a blog post. Blog posts begin with an idea, and several hours writing a first draft. I usually let that draft sit for a few days or weeks, sometimes months. When I look at them again I may decide not to publish them at all. About one in three drafts aren’t published for various reasons. 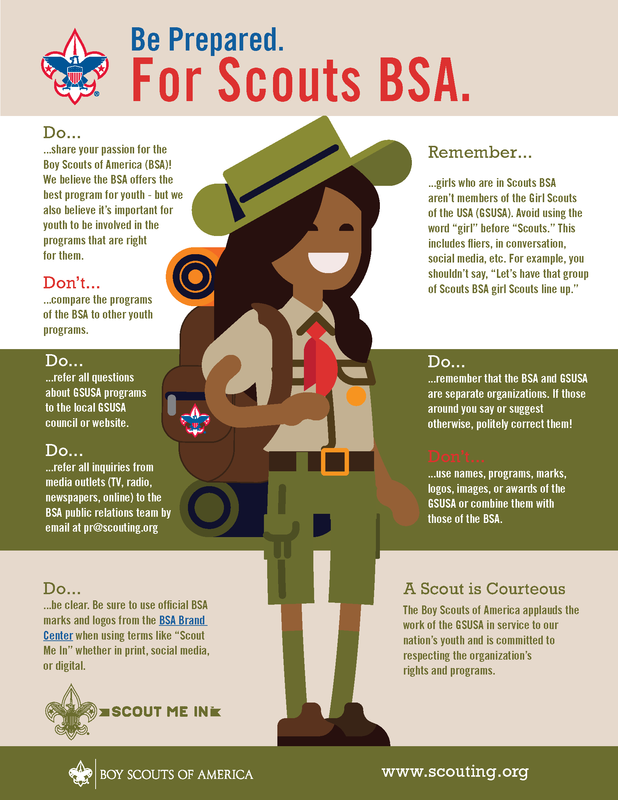 My recent post, Girls in The BSA?, wasn’t something I came up with on a whim. I’ve been thinking, talking, and writing about co-ed Scouting for years. In addition to the usual draft and revision regimen I also asked a professor of developmental psychology to review the post. I asked them to check the accuracy of my statements about gender. After a few more hours of revisions I published the post earlier this month. Girls in the BSA? asks if gender ought to define Scouting. I answer no, a Scout is a Scout, and tell how I arrived at this conclusion. At 640 words it is an intentionally brief post. I was aiming at writing why I think this is the right thing to do as simply as I could. Many people responded to the post. The majority were positive, a significant number disagreed and a few who did got angry and/or called me names. 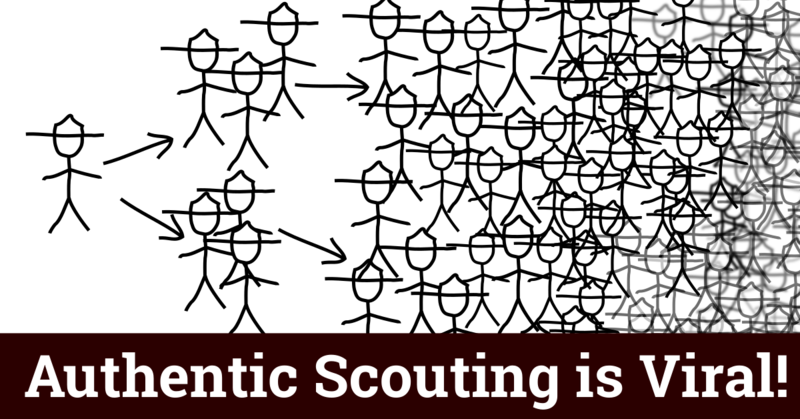 A week later in podcast 354 Gender and Scouting I talked about the post and responses. Two days after that, to my great surprise, the BSA announced girls could become Cub Scouts beginning next fall. The announcement went on to say older girls would be allowed to participate in troops a year after that. The details were sparse, but the direction was clear (or so I thought). There was no connection between the timing of my posts and the announcement. I hurried to put together links to the announcement and associated resources. I was overjoyed the BSA made this decision, and stunned at how quickly it had happened. After a few days it became clear things were not as I had hoped. Remaining as they are now, boys only. Separate units for girls and boys. In the ensuing discussions, online and off, I had growing concerns. I never imagined the BSA intended to limit girls to a separate but equal plan. After all, they had to know that’s exactly what people would call it, and the uncomfortable associations it invokes. I thought they’d at least recognize this was a much more complex and unworkable than a co-ed plan. How is this consistent with why the BSA offers membership to girls in at all age levels? While our curriculum is relevant both to boys and girls, our commitment to single-gender offerings remains the same. Our decision does not make our programs co-ed. (Emphasis in the original.) We acknowledge and celebrate that boys and girls develop differently, and there are times that single-gender learning is most appropriate. We will maintain the experience boys have had in our organization while at the same time expanding our time-tested programs to girls and young women. I had read things wrong. There’s definitely no co-ed option. Take two steps back if you don’t accept this premise. I am not out to stop you if you want to build your Scouting program on this premise. I am not advocating that the BSA mandates a fully co-ed organization. Families have legitimate differences in how they want to raise their children. Chartering organizations should have the choice to be fully co-ed, create separate girls-only groups, or remain boys only. This would be consistent with our history. Scouts from different religious backgrounds have had wide latitude in applying the program in a way consistent with their values for decades. Scouting should support any application of the program that helps young people in a way consistent with the oath and law. Now it’s clear the BSA separate but equal plan closes the door on the option of having fully co-ed packs and troops. The emerging details of the BSA plan places girls in separate “girl only” dens and troops. The BSA has categorically stated there will be no fully co-ed program for girls in packs or troops. This plan invites association with the troubled history of “separate but equal”. An unfortunate, unavoidable, yet totally accurate definition of the plan announced for girls. To borrow a well-known phrase from the legal holding reached in the landmark Supreme Court case Brown v. Board of Education; separate is inherently unequal. Although the BSA is not subject to the kind of civil rights laws in Brown v. Board of Education the fundamental moral principle is identical. I am, by far, not the first to make this association. Others have used it before and after the announcement. While the BSA has not used the phrase the decision embodies the same concept. Why no Fully Co-Ed Option? What I find really puzzling is why a fully co-ed plan isn’t even an option. What evidence for or against the idea was studied? Was it even discussed? If so why was it rejected? Assuming chartering organizations can choose to remain boys only, or have separate but equal units, what does the BSA lose by permitting those who want it to have a fully co-ed program? One defense of the separate but equal plan is the assumption girls are more developmentally advanced than boys between the ages of 11-14. It’s assumed this difference gives girls in a co-ed troop an unfair advantage, they will run roughshod over the boys, and the boys will quit in despair. If this is the justification why can’t younger Cub Scouts be in fully co-ed dens? If differences in developmental stages are so important, why do we not separate boys in troops over 14 from boys under 14? Are our Scouts or our organization so entirely different from the rest of the world we can’t meet the challenges or reap the benefits of a co-ed program? The Scouts Association in the United Kingdom, (founded by Baden-Powell in 1907) rose to those challenges twenty six years ago when they became fully co-ed. So did Scouts Canada nineteen years ago, Scouts South Africa eighteen years ago, so has almost every other Scouting organization in the world. As of today only 13 of the 160-plus member organizations of the World Organization of the Scouting Movement, of which the BSA is a member, remain ‘boys only”. Valid questions remain about how the decision was reached, the motives behind it, it’s potential effects on other organizations, and the way it was announced, but they aren’t the most important answers we need. Can the BSA separate but equal plan actually work? The BSA announcement mentions the goal of creating convenient programs for busy families. 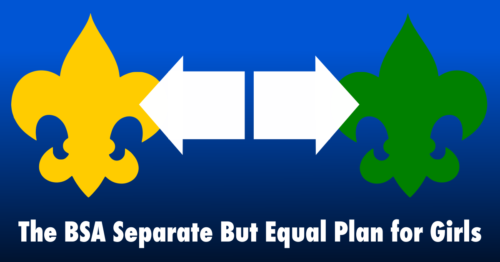 It’s difficult to see how the separate but equal plan achieves this goal. Establishing and serving separate but equal troops and Cub Scout dens will demand significantly more effort than accommodating 8 or 10 new Scouts in an a fully co-ed pack or troop. That additional effort and inconvenience is justified if it is the choice of families the chartering organization serves, but what if they prefer a fully co-ed program? We don’t yet know to what extent we’ll have to keep the girl troops and boy troops separated so we don’t know what the current plan does to our already crowded schedules. Will boy troops and girl troops share meeting space and time or go on camping trips together? Can they attend summer camp at the same time? Can they share existing volunteers or will we need to recruit a whole new set of volunteers? In Cub Scout packs scheduling looks less complicated. But requiring separate dens in Cub Scouts means recruiting additional den leaders to maintain smaller dens when it would otherwise make sense to combine them were a fully co-ed option available. These are just a few of the many questions that come to mind. At this point plenty of volunteers are asking themselves how they can possibly make this work. I understand if you find all this troubling. This is a big change. As the details become clearer I think a majority of volunteers are likely to disagree, in one way or another, with the BSA separate but equal plan. I think a lot of families won’t like it either. Someone defended the plan with the old chestnut “a good compromise leaves everyone equally dissatisfied”. Surely we can do better than that. Truly good compromises require the consideration opposing viewpoints to create a good agreement. It’s very hard work, but it can be done. People voluntarily comply with a good agreement because their concerns are equally satisfied. If everyone is dissatisfied it’s not”good”. We can, and will, find a way to work together on this, we are Scouters after all. Maybe one thing we can all agree on is the greater aim of our work. Whatever our disagreements all of us strive to make it possible for our Scouts to embrace and live out the oath and law. From that perspective everything else is window dressing. The uniforms, badges, jargon, paperwork, hallowed traditions, and even the organizations themselves only exist to serve the greater aim. I support a fully co-ed option because I am confident boys and girls are strongest and safest working together as Scouts. You may choose to work with your Scouts differently. I don’t want to restrict how you work towards the greater aim. All I ask is the BSA extend the same courtesy. You nailed it with your piece but could have explored if this was perhaps the best “compromise” that BSA could offer and still get girls onto the registration rolls. It lets those who are insistent on staying boys-only do so with a degree of institutional cover so they don’t look like total luddites while also providing an operating framework that makes going co-ed easy (same time, place, program and leaders). Whatever it takes, gotta get that $33/year. Would there be this problem if the word “Boy” was not in the official name of BSA? I don’t mean to sound silly. But if it was SA instead of BSA the transition might actually make more sense. I believe that full integration will eventually happen. My own daughter thought she was a Cub Scout because we are a Scouting family. My wife and I were both leaders. Our daughter tagged along with almost everything we did. She was quite disappointed when we toled her she couldn’t hang out with the troop. When she was 14 and joined a crew. She went on joint outings with my son’s troop. Where I was a leader. Their were no problems. As for finding additional adult leadership. I’m confident some moms will step up for an all girl den. Mr. Green, you have so eloquently stated everything I have been saying bout this change since I first heard it discussed several years ago. Your words ring truer than any others I have read or heard and I thank your for your scouting service and for all you have said, have done, and will continue to do. You are very kind. I thank you. The National BSA model for ages 11 – 17 is not economically practical nor sustainable as it requires chartered organizations or units to come up with additional resources in terms of funding, troop equipment and adult leadership. I predict that at many chartered organizations the “separate-but-equal” units will exist only on paper, but in practice will operate as a co-ed unit. 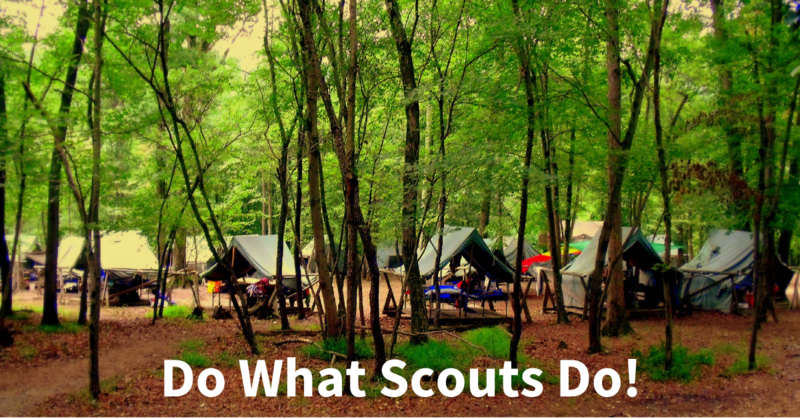 I’m a 30+ year Scouter and I look forward to the challenge of making co-ed Scouting work. BPSA-US is another scouting option for those who want inclusive scouting yesterday. 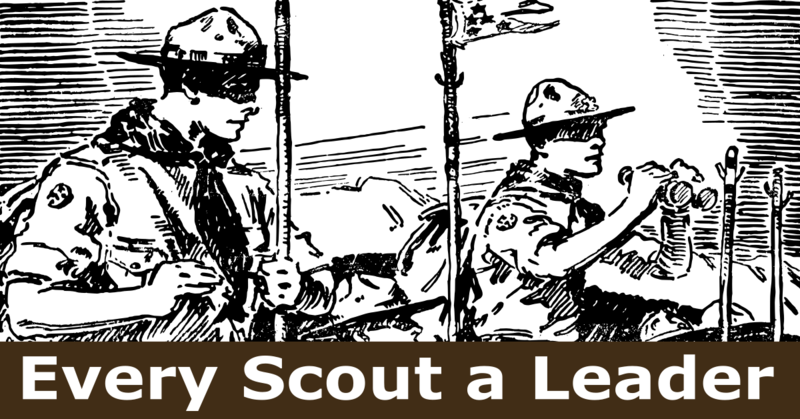 It is founded on traditional, practical scouting, Baden Powell’s patrol method. It’s fun for all ages, classes, Creeds, genders. Hello Clarke, Thank you putting this down on paper. I did read “Separate but equal” but thought it was my imagination. Guess not. I had a couple great conversations at the local council event this past weekend. It was a cub scout event however families were allowed. There were siblings with the dens. I happened to chat with Girl Scout Leaders. I have nothing to compare to because I have 2 boys so I listened very carefully. One leader told me about how the girls learn to set up a fire and then are able to lite the fire later in life after they have mastered the earlier skills. They also told me about the camps and different ways of fund raising. They also told me about 2 different programs – 1 did the outdoor stuff and one did not. It is based on who and what the leaders what to do. Girls do learn skills earlier than boys scouts but it seems it comes with the what the leaders want to do. I have seen the girl dominate during the den meetings. Keeping the girl and boys in different dens then patrols should help this organization grow. Yes it will require additional resources but the more scouter we have the more the better the program will be run. Again letting youth figure it out may help. Thank you for what you do for scouting. Hold on, Clark. “Separate but equal.” Are you seriously going to compare the evils of Slavery and later Racial segregation to that of a private youth development program? Is the plight of men and women to live burdened in an unjust society really to be compared to the way we run a club for kids? Apples and Oranges. And why are you not dismissing out of hand such an intellectually lazy argument. Now, I think Boy Scouts should be for boys and Girl Scouts should be for girls. But that is not happening at this time. But don’t worry. The progress of the BSA in doing this will follow the path of the English Scouting Association. Thirty years ago the SA proclaimed a co-ed organization, but allowed the local units to choose which way to go. This caused a bunch of SA Scouters to leave, shrinking the program. But as years went on, new Scouters came on board, uninformed about the old way of Scouting, and used to the idea of a co-ed SA. So ten years ago the SA mandated all unites to go co-ed, doing away with the local decision. The BSA will do the same. The current leadership at national will try to stop the bleed of experienced Scouters who will leave the BSA. They will compromise, try to stabilize the membership, introduce new practices slowly, wait for adamant old guard Scouters to “retire”, and when the attitudes of the majority of adults has shifted, order the mandatory inclusion of females into every program and age group. This follows the shift in values among the leadership of the BSA itself. In 2000, the attitude was that Scouting would maintain traditional attitudes about gender roles and sexual relationships. Look at what they do not. 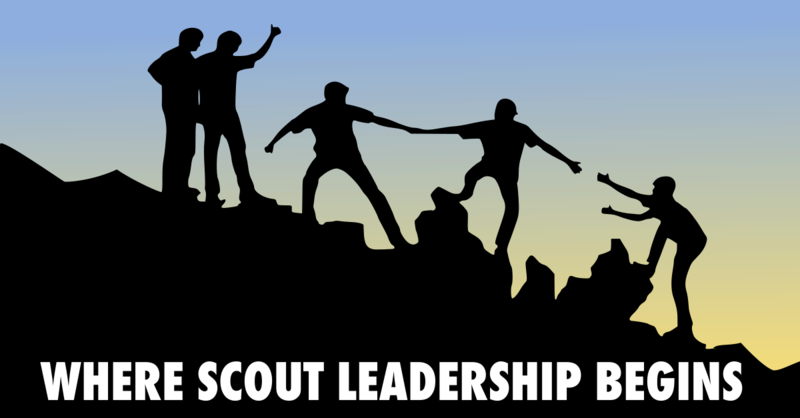 An entire generation of Scouting executives has phased out, and a new and differently thinking group is not at the helm. I think the most disturbing thing about this decision is the undemocratic attitude in which it was made. In 2013, the BSA called in the local leaders from all over the country and put the question about including gay youth to the rank and file. The decision reflected the whole organization. The last two of these course changes, including gay adults and including girls, has totally been made by a small group of executives without the input of the people who make the program work. I am afraid there is only one way to vote now. With your feet. I think the BSA executives will just lay low and wait out the membership shrinkage, until it stabilizes and they can go forward with their ultimate vision of modern day scouting. “Is the plight of men and women to live burdened in an unjust society really to be compared to the way we run a club for kids?” Yes, when the comparison is accurate. Is it on the same scale? No. Is it morally and ethically equivalent? Yes. You are mistaking comparison with conflation. I specifically draw attention to the Supreme Court’s legal finding in Brown – “separate in inherently unequal” an apt assessment of the BSA’s plan. The BSA’s policy past decisions regarding women serving in the capacity of Scoutmaster, sexual orientation, gender identity, and now permitting girls to become members are all additive, inclusive decisions that extend rather than limit opportunities. They are not subtractive, they do not eliminate the option to remain exclusive at the unit level. At our Roundtable, we discussed this issue (surprisingly) briefly. In order to help support the volunteer needs of the future gender-segregated units, I proposed that chartered organizations informally adopt the “Scout group” structure used in many other national associations. I think that may have piqued some interest, but we had a lot of folks who were still digesting the announcement, so we didn’t have much discussion. Do I myself think that separate but equal is going to work? Ultimately, no. Even if the programs are identical to the letter, having them separate will always give people the idea that something better (or lesser) is going on next door. There’s already a workaround. Have your boys-troop and girls-troop. The scoutmaster dual registers with both. Then have both troops meet on the same night at the same time, and at the same place. You have two troops on paper, but in reality they function as one. What a great place our American society would be if boys and girls together could grow up with boys’ behaviors towards girls influenced in some way by the Scout Oath and Law during their formative years? Truly a missed opportunity. I fully agree with Craig – imagine being the scouter or parent telling their female scouts that the den cannot continue and that she will need to go to a girls only troop. You can’t think “separate but equal” and not think “discrimination”. Hardly a lesson to be proud of. This is worse than had they left it status quo, imho. Really disappointed- both in the decision itself, and that I missed the fact that it’s not co-ed. Thanks for clearing it up, Clarke! Separate but equal got shot down by the US Supreme Court decades ago. BSA & Girls is great ,Separate but equal is not. Wish I could say it as well as you did. The idea of starting a girls troop here and one there with small numbers and no equipment might be just enough to prevent it from happening. Although the stated policy indicates dens in “boys & girls packs” shall be segregated, I expect that policy would quickly prove unsustainable (at least in our CO’s pack, which has dens currently established by age group). Should our CO adopt a boys & girls pack, I would expect the few girls who come attend as Bears or Webelos would be invited to sit with their peers, if out of nothing more than simple courtesy. The enforcement of any segregation won’t appear until Boy Scouts, whereby girls will be expected to register with a girls-only troop. But fast-forward our co-ed den, above, upon its crossing-over; do we really think something as innocuous as a different troop# on her uniform will prevent her from hanging with the team she’s been with the past year or so – especially in the name of “family scouting”, if she has a boy sibling already in that troop. My expectation is the first girls to participate will be those with strong ties to scouting through siblings. Those girls (supported by their families) will quickly dissolve the segregation, if not in BSA policy then by simply showing up in uniform.